"It's funny, every time one of us leaves, I wish we'd made it." Jack Lemmon's legacy as an actor seems to be tied to his various comedic parts, but throughout his career the actor took numerous risks in hard-hitting dramas. Sure, his collaborations with Billy Wilder are among the best of his career, but there's an element that's based more on technique than substance. As Harry Stoner in Save the Tiger, however, Lemmon seems to be tapping into something deeper in this Oscar-winning turn in 1973. Harry Stoner is the president of a fashion company that is on the brink of bankruptcy. On the surface, everything seems good; Harry lives in the lap of luxury. He's served breakfast in bed and converses with his wife, Janet (Patricia Smith), nonchalantly. This is all a façade that masks Harry's impending doom for the willfully ignorant. Despite having a car phone and sharp-looking designer's suit, the company's finances cannot eke through another season and Harry's feeling desperate. In order to avoid bankruptcy and an audit of the company's questionable arithmetic, Harry seduces his partner, Phil Greene (Jack Gilford), into hiring an expert arsonist (Thayer David) so they can collect on the insurance policy. Choosing to focus on one man's plight during an era of major social upheaval, writer Steve Shagan and director John G. Avildsen create an engrossing human drama that offers no sense of absolution. It becomes clear quite early in the story that, no matter what he does, Harry Stoner is lost in a moral vacuum. He's given up on everything he once believed in, whether it is baseball or the promise of the American dream. Claiming that there are no rules to govern human behavior, Harry has no hesitation about hiring prostitutes to sway customers, nor does he yield to Phil's pleas that they find an alternative to insurance fraud. Yet, at the same time, Harry yearns for something better than his life can offer. Picking up a young hitchhiker, Myra (Laurie Heineman), he makes a sincere effort to forge a bond between the two of them. It's all in vain, of course, because Harry is emotionally catatonic. Save the Tiger is the kind of movie that will leave many audience members feeling dissatisfied due to its bleak outlook. Jim Crabe's cinematography shoots through all pretenses and depicts what seems like a true story developing before your eyes. Coming away from the film, I had a sense of dread because there are people in the world like Harry Stoner: relatively good men who simply give up hope and allow their life to fall to pieces. Avildsen's storytelling does not marginalize this difficult fact of life by pontificating about society's demeaning of the individual, nor does he present some dubious moral that presumes to have all the answers to Harry's failed life. When the closing credits role, there's a great sense of mystery—how did Harry find himself in this position, could he have avoided it, is there any chance that he'll find redemption? The questions seem to be unanswerable, probably because Harry himself doesn't know. Lemmon captures the character beautifully, suggesting in his performance that many of Harry's motivations are rooted in the subconscious. Jack Gilford is also impressive as Phil, delivering a performance that captures a man's decent into moral oblivion. There are a few moments in the script that verge on parody, such as when Harry gives a rambling speech to Myra about the 1960s, and the film would likely be stronger without them. Maybe the best moment comes late, when Harry looks at a poster of a tiger next to an activist's stand. Not a word is spoken, yet it says everything. Image Transfer Review: The 1.85:1 anamorphic widescreen transfer is grainy and contains numerous print defects, but I suspect much of this can be attributed to the source material (since the film was quite low-budget). The overall feeling of the picture is pleasant, presenting the cinematography well and having nice contrast. Colors look good and detail is sufficient. Audio Transfer Review: The original mono mix is preserved for this DVD, which is a nice bonus for film preservation enthusiasts. Dialogue is always audible and the music comes through nicely, creating a well balanced mix. There are a few spots in which the track contains noticeable hiss, but otherwise this is a clean track. Extras Review: The only supplemental material is an audio commentary by director John G. Avildsen and writer/producer Steve Shagan. Oddly enough, this is not advertised on the package, but you can access it with your remote or by checking the set-up menu. The two men come across as slightly pompous, especially when Shagan interrupts the commentary to ask for a better Tequila. Additionally, they also exude a sense of misogyny by constantly commenting on the actress' figures. Thus, while the two give some interesting remarks about financing the movie and working with Lemmon, I feei sour about their commentary. 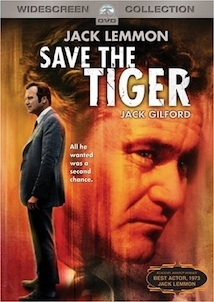 A true gem, Save the Tiger is a powerful expression of personal loss of self during the 1960s and '70s. Anchored by Jack Lemmon's gut-wrenching performance, the film receives adequate treatment on DVD, featuring transfers that accurately portray the original theatrical presentation. While being light on the extras, this disc is still worthy of purchase.